I’ve supplemented Mr. Fuller’s black and white sketches with additional pictures of carriages from Wikipedia, Ackermann’s The Repository of Arts, Literature, Commerce, Manufactures, Fashions and Politics (Thanks, Sarah Waldock, for the Ackermann tip), Carriages & Coaches :Their History & Their Evolutionand, and Modern Carriages. 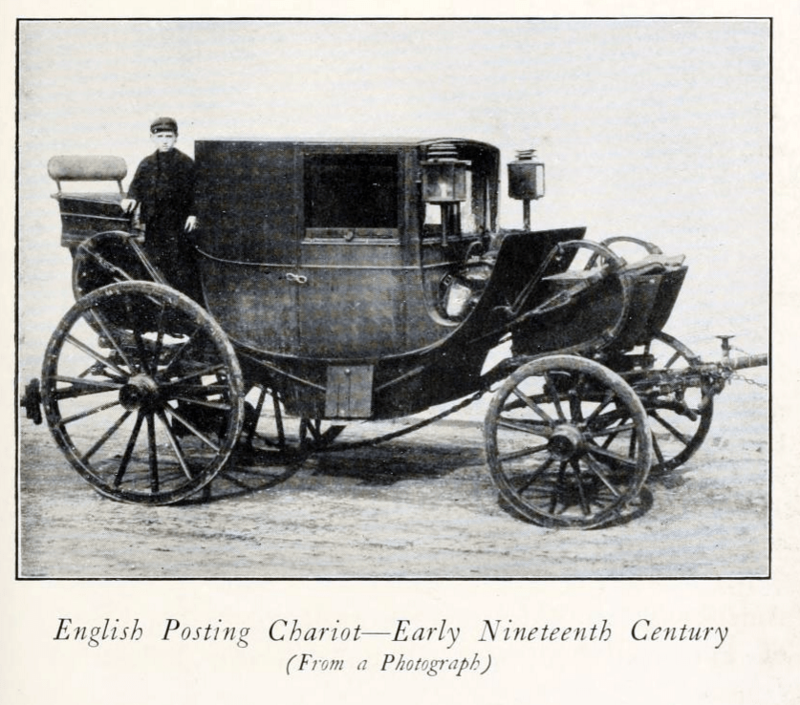 The modern chariot is understood to be on four wheels, the body part covered, and differing from the coach in having one seat only, instead of seats facing each other. In weight both carriages are nearly equal; in fact, many modern chariots are constructed of greater weight than the generality of coaches. Chariots are usually required for two principal purposes ; viz. for town use and for travelling. Those for the former purpose are furnished with a seat in the front for the driver; which seat, in well-finished carriages, is ornamented with a handsome drapery of cloth, trimmed round with fringe, &c. as will be hereafter described, under the name of “hammer-cloth.” Those for the latter purpose have a seat behind, the horses being driven by a postilion: by this arrangement the view from the carriage is unobstructed. By far the greater number of modern chariots are made to combine both these properties. No. I. is the representation of a modern travelling-chariot with its various appurtenances and accommodations for luggage. The body (by this is meant the covered part, having one seat of sufficient width to contain three persons, a door on each side, folding steps, and glasses to draw up, &c. and is suspended by leather braces, from springs upon each corner of the carriage part), fashion requires this part to be made large, very large in comparison with those which were made some few years since. 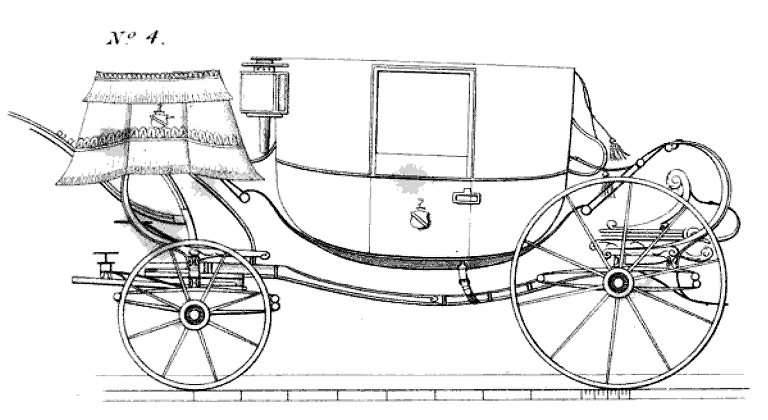 This increase of size affords so much more interior accommodation, that small seats for the younger branches of a family are not unfrequently placed under the front windows, facing the back seat, and being made to remove at pleasure, does not affect the appearance of the carriage as a town chariot, and affords, in many instances, the accommodation of a coach. Between the front of the body and the splashing fence is carried the bonnet case, marked (c). Upon the roof of the body are two imperials, marked (i i).Upon the front of the carriage part (by this is meant the whole of that part of the vehicle to which the wheels and axles are attached, with the springs before named, upon each corner for supporting the body) is a large boot, marked (b), in which, is received a trunk or boxes, and upon it may be carried the imperial, marked (b i), usually designated “the boot imperial.” The hind part of the carriage supports a seat for two servants, which is constructed upon a boot of a suitable form, usually denominated “the hind rumble,” and is calculated to contain two large boxes or trunks. 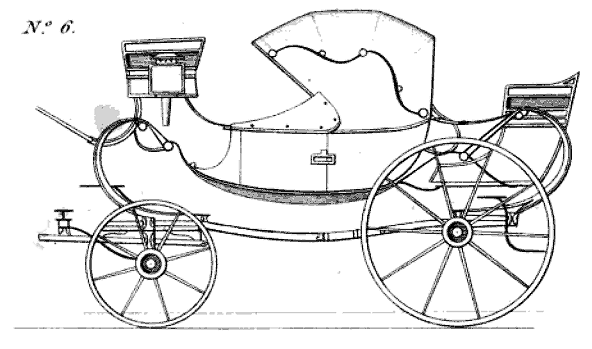 By removing from this carriage the bonnet case (c), the imperials (i i) and (b i), and the hind rumble seat, and then attaching upon the front boot a driving seat, and also a pair of standards upon the hind part of the carriage from whence the hind rumble has been removed, and you have the complete town chariot No. 2. This description of chariot is very heavy, and although it is used for town work with a pair of horses, will require four when loaded with its appendages for travelling. The front or driving seat is sometimes used also, in which case this chariot affords accommodation for seven persons: viz. 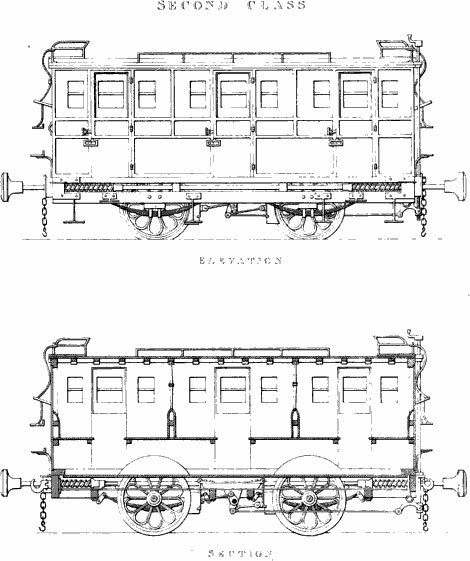 three in the body, two upon the driving seat, and two upon the hind seat; and sometimes, as before mentioned, two small seats are introduced to the inside of the body, making in all nine persons; affording, as already observed, the conveniences of a coach with the additional advantage of a very useful article for package, viz. the bonnet case (c), which the form of the body of a coach does not admit. No. 3. is a different style of chariot; its appearance as a town chariot is sufficient for general purposes, and being somewhat lighter in its construction than No. 2. is more suitable for the country. This chariot also admits of a similar adaptation for travelling, although on a more limited scale. Thus, the driving seat can be removed from the front boot (b) to the hind platform (p), and the imperial upon the roof with the bonnet case in front, as described in No. 1., might be added: such a chariot with these appendages might at all times be drawn with a pair of horses. 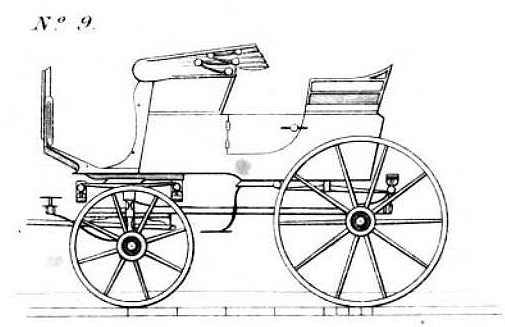 The greater part of the better finished carriages for town use are now constructed with springs horizontally fixed upon the axletrees: these are denominated “under spring carriages.” By the action of such springs the carriage part is relieved from the shaking of paved roads, and its durability much increased. A carriage so constructed admits of the boots and seats for servants to be fixed upon the beds of the carriage part, instead of being attached to and swinging upon the same springs as the body. The drawings Nos. 1. and 2. are upon this construction. No. 3. being without this improvement, it will be observed, that the boot in front and the platform behind are attached to iron work branching from the body: the whole is in consequence supported by the same springs, which are required to be made stronger for that purpose. The coach, as before observed, differs only from the chariot in the form of its body, which is made with seats facing each other. The large modern chariots having almost superseded coaches for the purposes of travelling, excepting with families of large establishment, coaches are now mostly used for town work, for which purpose they are sometimes very expensively finished. No. 4. is the representation of a town coach: the body is usually built of sufficient size to contain two persons on each seat. The driving seat is supported upon the front beds of the carriage by what are termed “coach-box standards,” and is furnished with a hammer cloth; upon the centre of which is placed the crest, and sometimes the armorial bearings, in embroidery, or chased in silver or yellow metal, to suit the furniture of the carriage. A row of deep fringe is continued round the bottom edge, and occasionally another of less depth upon the top. Upon the hind beds are the footman’s standards. This appendage is not only ornamental, but is found of great use in places of public resort, as it prevents the poles of other carriages coming too close. 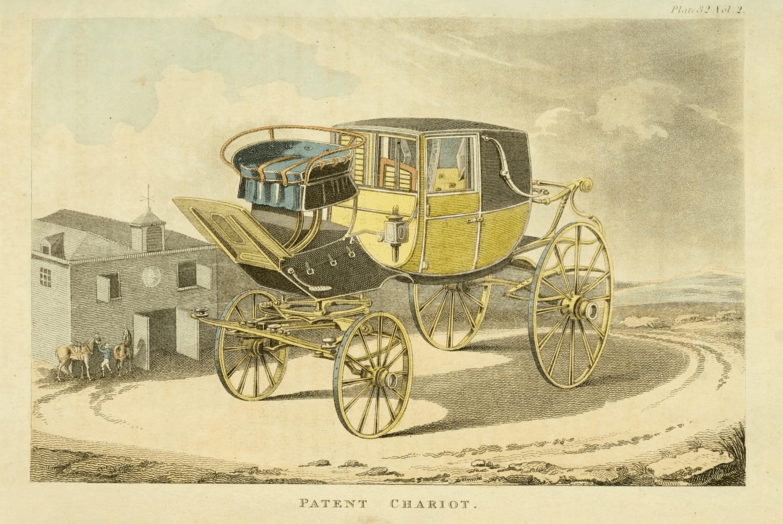 These appendages are not confined to the coach; they are applied with equal effect to the town chariot; but as they appear more in character with the former vehicle, we have described them in connection with it. Coaches are sometimes made to contain one person only on each seat: such a carriage is designated a vis-à-vis, and is used only by persons of high fashion and large establishment. The style of finishing modern carriages has been for some time past with as little external embellishment as possible (those kept expressly for town-work excepted). Fashion seems now to require some additional ornament. The linings are of superfine cloth, with squabs of morocco leather or silk tabberett, trimmed with handsome laces of silk and worsted, and sometimes entirely of silk: the colours are claret, crimson, and different shades of drab: these are determined partly by the taste of the owner, and partly by the colour of the painting, upon which fashion does not appear to exercise much influence. At present, clarets, pale greens, browns, and yellows appear in almost equal proportions. The observations already made upon coaches and chariots apply equally to these carriages; the only difference being in the bodies, which are made to throw open. To effect this properly, much skill is required in making the body itself, or the doors will soon be found to open and shut with difficulty. The means employed to remedy this inconvenience affect the grooves in which the glasses slide, and render repair necessary to these parts also: this soon leads to a derangement of the whole. The use of these carriages has of late much declined, probably in some measure from this circumstance, but chiefly on account of the additional attention required to them, and their increased weight, from the greater proportion of iron work employed in their construction. 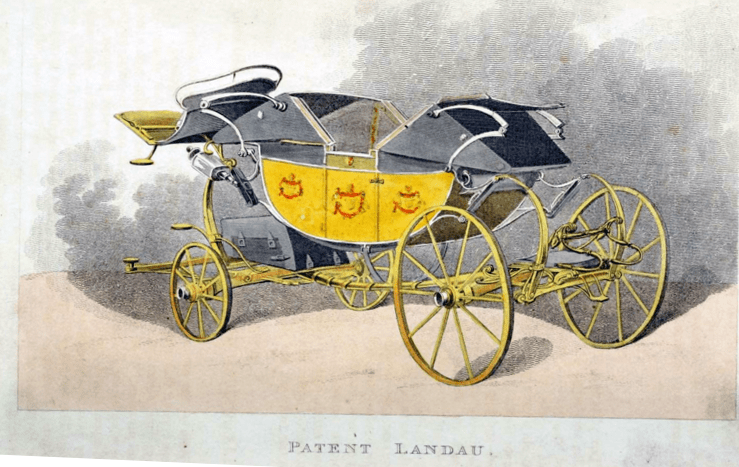 See an image of a Landau at the Carriage Museum of America. The Barouch was introduced from Germany to this country about the year 1802. It was the fashion at that time to build carriages extremely low; and the better to effect this purpose, the front part of the body was arched upwards, as in the drawing No. 5., to admit of the front wheel passing under the body in locking the carriage for the purpose of turning. 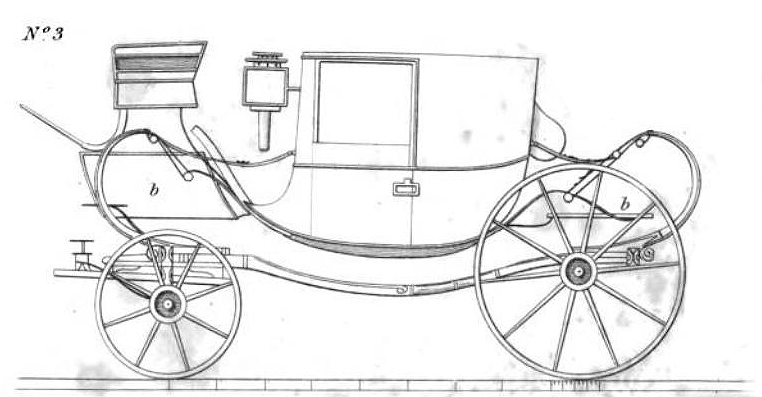 The barouch has seats inside facing each other, similar to the coach and landau; but with a view to lightness the half head was contrived, which, when put up as in the drawing, covers only the hind seat. 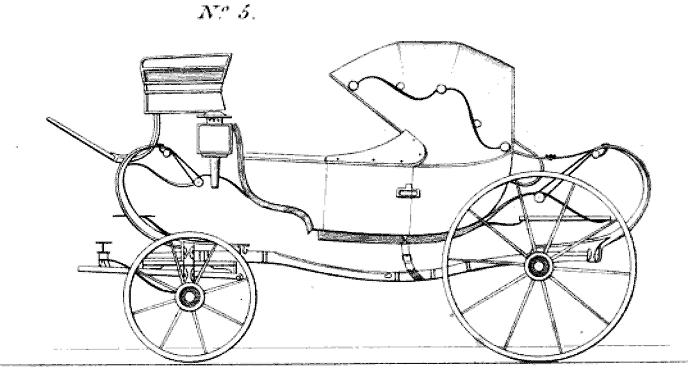 These constitute the leading features of the barouch: the most conspicuous is the arching up of the front part, which soon became fashionable, and was applied to other carriages, particularly to landaus, and these carriages when so made were termed barouch landaus. 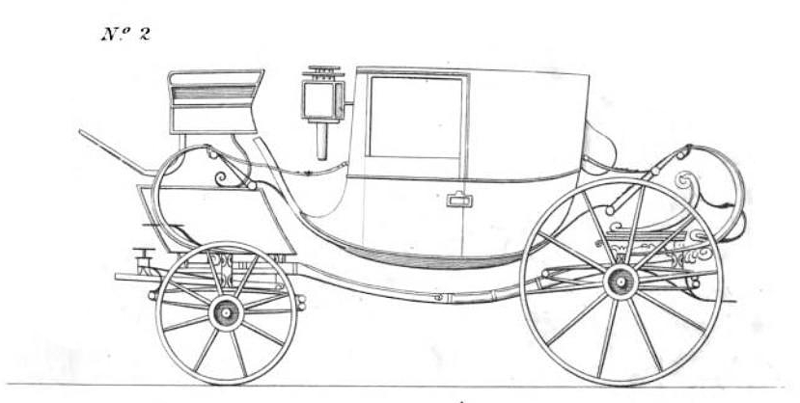 As higher carriages became fashionable, this arched front part being no longer of use, was gradually abandoned; yet, notwithstanding, the half headed carriage still retains the name of barouch. 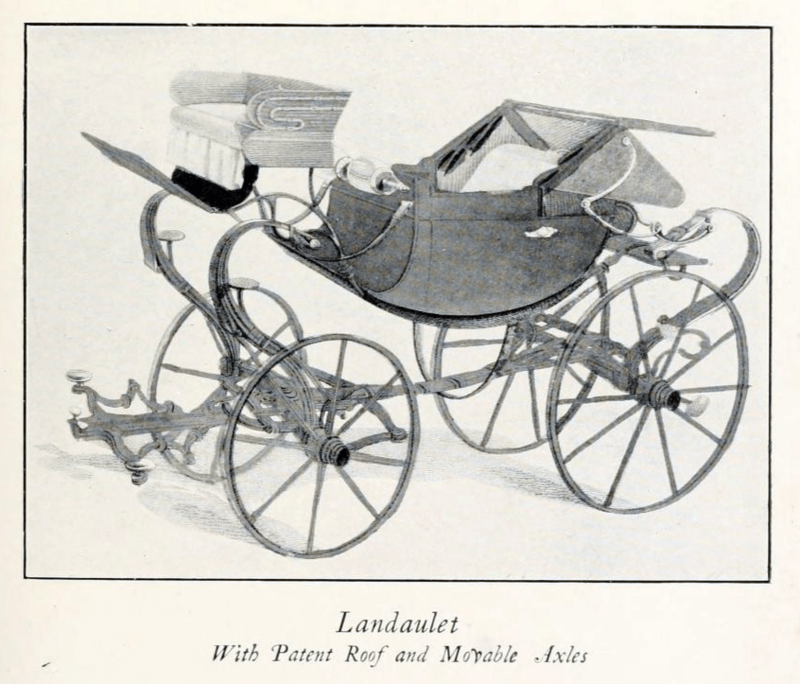 The barouchet bears the same affinity to the barouch as the landaulet does to the landau; viz. that of having only one seat in the inside, instead of seats facing each other. No. 6. is the representation of a barouchet. 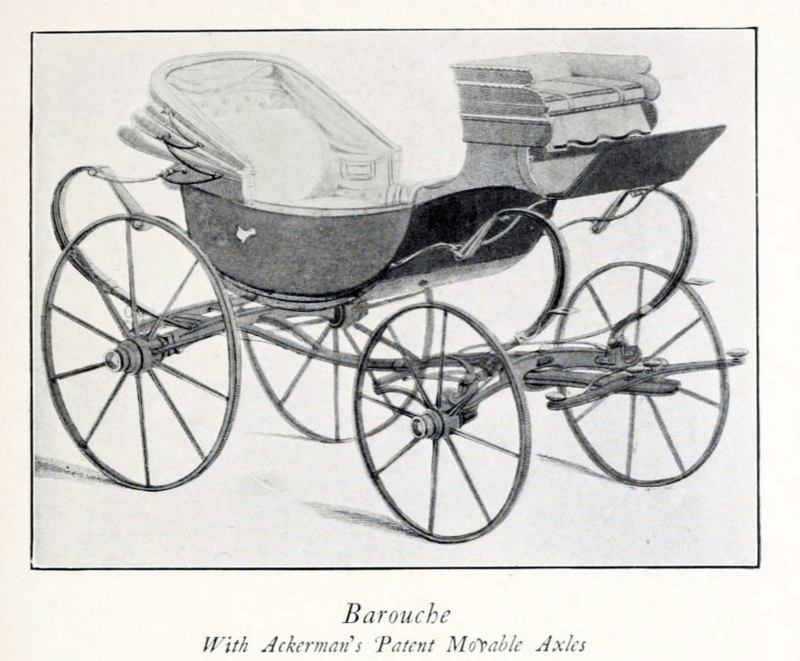 The barouch and barouchet will accommodate the same number of persons as the landau and landaulet; and being made of much lighter construction, they are on this account greatly to be preferred for summer use and short excursions in fine weather. Indeed, the barouchet is often built so light as to allow of being drawn by one horse. For this purpose the body is usually constructed upon what are termed “nut-cracker” or elliptical springs, similar to No. 7– If due attention be paid in the building, a carriage on this construction may be made sufficiently light to form a very neat and convenient one-horse equipage. This carriage is also of continental origin, and was introduced to this country soon after the peace of 1814. The Britska is a carriage peculiarly adapted for travelling, being so well calculated for receiving luggage. The bottom of the body is nearly straight, with a large boot in the front part in continuation: this boot and the spaces under the seats admit of large square boxes, and the form of the body allows of the perch being made nearly straight, and shorter than to other carriages: the steps being placed on the outside, gives room for two ample pockets in the space which they would otherwise occupy if folded into the carriage in the usual way. The head is furnished with glasses in mahogany frames which inclose the whole of the front, and are so contrived as to fold up in a portable form, and fasten to the upper part of the head when not required. These carriages are constructed either with one seat, like the barouchet, or with seats facing each other, like the barouch, as may be required. No. 8. is the design of one with a back seat only, which is generally made of sufficient width to contain three persons. The folding glasses in front render this seat equally secure from wet as that of a chariot. The front part of the body, as well as the boot in continuation, are usually appropriated to luggage, or will afford sufficient space for those who travel inside to repose at length. The seat behind contains two servants, with room in the boot part below for additional luggage. Another seat, capable of accommodating one or two persons, is obtainable in the front by affixing the small portable seat (marked P. S.) upon the boot, with the small footboard at the bottom, which, when not required, turns back underneath the body. 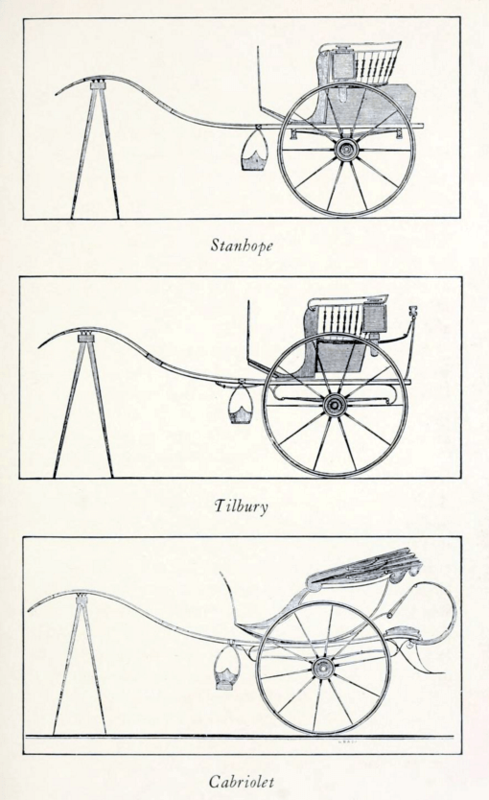 These carriages are very convenient for travelling, and a pair of post-horses will generally draw them at a quicker pace than most other carriages, although when loaded the weight might be greater: this arises from an idea of lightness on account of the shortness of the carriage, and the luggage being concealed by the form of the body. 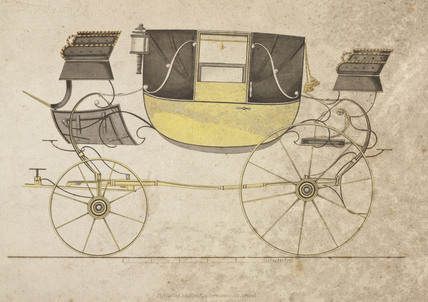 About the time that driving became fashionable, the Phaeton was introduced; and as this appears to be the only four-wheel carriage of any decided character of English origin…we must refer the reader again to Plate 3., and solicit attention to the preposterous situation of the body, which was gradually brought to this extremity with the view of obtaining a better command over four horses. In descending hills, the weight of this body frequently preponderated so much as to raise the hind wheels from the ground, to prevent which it became necessary to place a weight between them. This phaeton was for a considerable time looked upon as a most elegant carriage, and the only one from which four horses could be driven. Indeed, our most gracious sovereign himself, to whose valuable patronage the coachmaking trade are so deeply indebted, used frequently to drive an equipage of this sort. 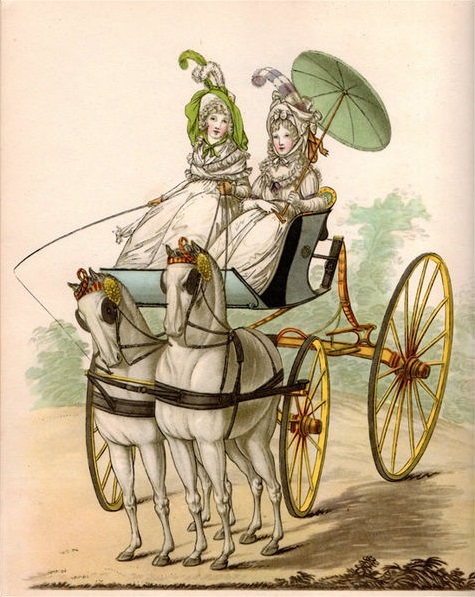 As driving became more fashionable, more attention was bestowed upon the driving-seats of other carriages, and the compact and then novel form of the mail-coach gave rise to the adoption of carriages upon this principle for driving four horses; and about twenty-five years since, a number of fashionables, termed the “Whip Club,” used to assemble with elegant equipages of this form drawn by four horses in hand. The author has frequently seen from twenty to thirty assemble in the vicinity of Cavendish Square, and drive off in procession. A more imposing and gratifying sight could not be imagined. From this period phaetons have been looked upon as carriages more suitable for a pair of horses; and they now appear to be brought to perfection, as they seem to want nothing either as to ease or convenience. The first we shall describe is No. 9., which is certainly the most complete and serviceable phaeton now in use; it is usually denominated the double-seated phaeton, and is generally constructed upon horizontal or mail-coach springs. The advantage of this plan consists, in the weight being supported by each corner, immediately over the bearing of each wheel; and each spring being fixed at its centre, allows the carriage part to be constructed much shorter and lighter, and at the same time with more strength and simplicity than if the body was suspended from upright springs and leather braces. The body part, containing both seats, is one continuation of light frame-work, cased with pannel board, affording space inside for large boxes and other accommodation. These seats are also so contrived as to admit of being changed from back to front at pleasure, a source of great convenience when a servant is required to drive. 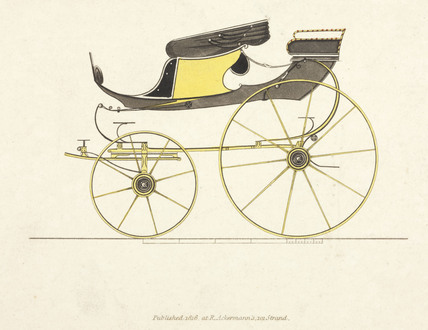 It will be observed, that the carriage part of this phaeton is constructed with a perch, consequently the front wheel can only lock to a certain degree; but as gentlemen keeping such equipages are generally proficients in the art of driving, this circumstance becomes a matter of little moment: should it be otherwise, an iron perch can be used, which could be arched upwards to admit of the wheel passing under: this is termed a swan perch, and possesses all the advantage in this respect of the old crane neck carriage, which has been laid aside for some time on account of its weight. No. 10. is another plan of phaeton: its construction differs considerably from the other, being built without a perch, and possessing all the advantage of a crane-neck carriage without its weight. The greatest proportion of these phaetons are built sufficiently light to allow of being used with one horse, for which purpose the property of locking freely round is of great importance, as one horse will turn more suddenly than can a pair of horses harnessed together; and the event of a sudden and violent turn (if the front wheel has not a free lock) must be to overturn the carriage or break the shafts. The same effect takes place if the horse should back on a hill, as the slightest deviation of the hind wheels from a straight line brings the carriage upon the lock, when, if checked, the same consequence necessarily follows. 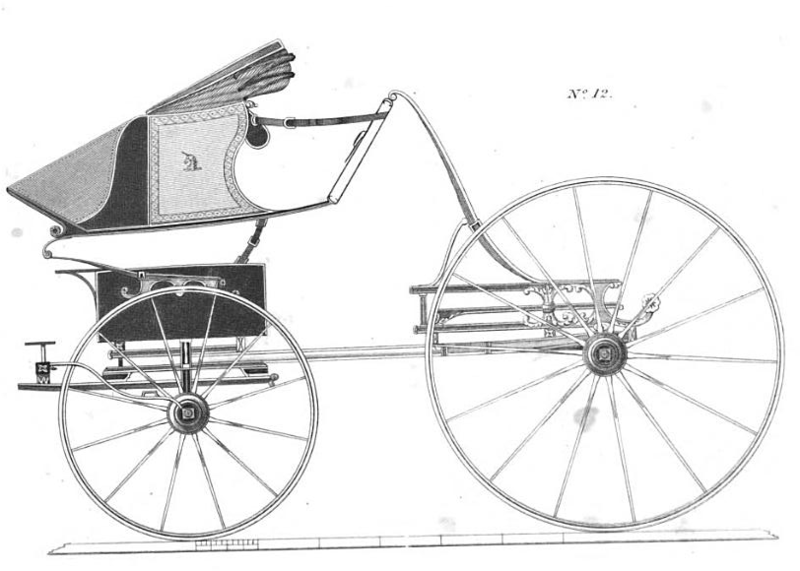 A phaeton, if required to carry two persons only, and to be drawn entirely by one horse, can be built equally light as a Stanhope; and by arching upwards the bottom of the body, a higher front wheel may be obtained, thereby rendering the carriage much more suitable for using with the sort of horse generally driven in Stanhopes. No. 11. will give an idea of such a carriage. The form may be varied to suit the pleasure or accommodation of the owner. An additional seat for two persons may be added, when required, to the hind part; or it may be so contrived as to turn back and form a seat. 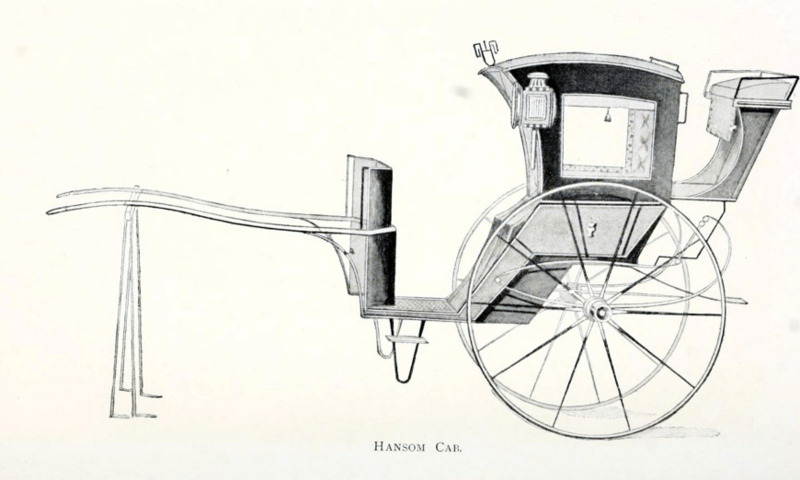 Some of these carriages are constructed on a smaller scale to go with lesser horses; others have seats behind, which are made to fold into the hind part of the body when not required, similar to No. 10. or 11., and a considerable proportion are made with detached seats in the front to drive from. Some of these cannot properly be termed phaetons; they appear to have more claim to the appellation of barouchets, or perhaps barouch phaeton may be an appropriate name. The word phaeton is ‘certainly meant to imply a carriage to be driven from; that is to say, the body itself should form the seat for the driver, and, when the construction of the carriage and form of the body does not allow of this, the name of phaeton is clearly misapplied. The additional safety of a carriage upon four wheels over one with two only, is a circumstance of great importance to the timid and infirm; yet many are induced to forego this advantage from an idea of the increased weight and resistance of four wheels in draft. The better to enable the reader to judge how far this opinion is correct, we propose to make some further remarks on these carriages in comparison with those upon two wheels, in the course of which we. shall point out the peculiar advantages of each. The curricle is a carriage so generally known, and at the same time so little in use at present, that a slight description will sufficiently answer our present purpose without any graphic illustration. The curricle is usually constructed with large springs behind, and lever springs in the front. Like other two wheel carriages, it is necessary that the preponderance of weight should be in the front part: this weight is supported from a bar attached to the horses’ backs, by upright irons fixed in a secure manner upon the saddles: from the centre of this bar is a brace, by which is suspended the pole of the carriage between the horses; the pole is connected to the brace by a long spring, the elasticity of which relieves the rider from the up and down motion communicated to the carriage by the action of the horses. Curricle horses require to be matched with great attention; for unless they step together, the motion of the carriage becomes extremely unpleasant. We are indebted to our neighbours for this machine: with them it may be a useful carriage, answering, no doubt, the purposes of individuals of limited means sufficiently well. The modern cabriolet is large and commodious in the body, which is furnished with a head, and framed knee-flap. Hung with curricle cee springs behind, long under springs in the front, and others horizontally fixed under the shafts, and a platform behind for a servant to stand upon, this carriage is equal in weight with a curricle. That it is convenient cannot be denied; but it has no claim to elegance. The eye is at once offended by the disproportion of the means employed to draw it. 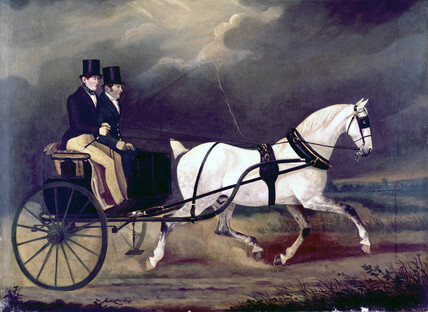 Certainly some of the finest horses in Europe are driven in them, and, perhaps, to this circumstance is to be attributed the preference given to these carriages by persons of rank and fortune; as the high price such superior horses command will always prevent the cabriolet becoming too common. 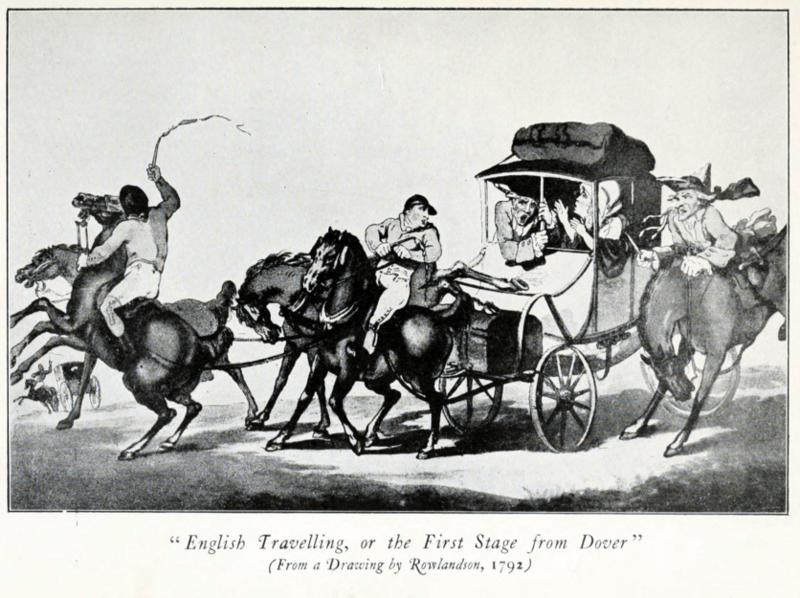 The lighter descriptions of two-wheel carriages were generally comprehended under the names of gigs and one horse chaises, until Mr. Tilbury, of South Street, Grosvenor Square, introduced the carriage which has borne his name. See an image of a Tilbury from Science and Society Picture Library. 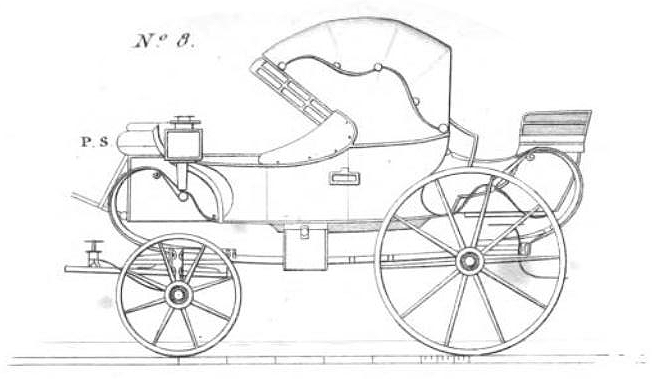 This carriage possesses the same advantages as the Tilbury, with more convenience for traveiling, the body being formed to receive large boxes or luggage under the seat. 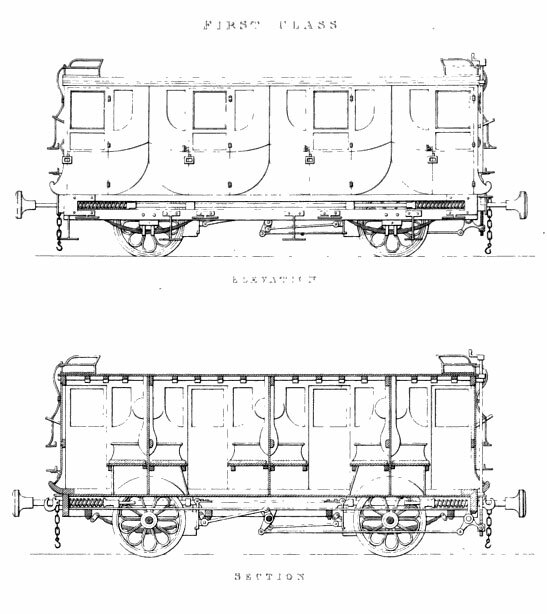 This carriage as well as the Tilbury is too well known to require the assistance of drawings, for illustration. Indeed, a two-wheel carriage can be only imperfectly represented by a drawing in elevation. It must be seen round before an idea can be formed: in fact, it should be seen with the horse in it. As much depends upon the form and position of the springs as upon the construction itself. 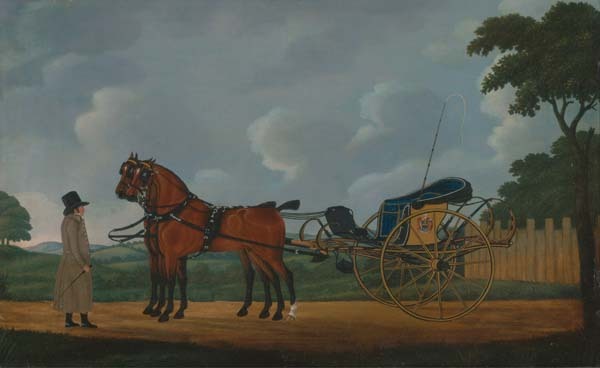 The adjustment of the weight to the horse’s back and the line of draught are principal objects; besides which, there are a variety of minutiae without attention to which the carriage is not complete, and the experienced driver will soon perceive that something is wanting. This carriage and the Tilbury require fine-actioned horses with plenty of bone, about fifteen hands two inches high. With a Stanhope a lower and more compact horse is sometimes used; but, when speaking of a Tilbury horse, the description of animal first mentioned would be understood. A variety of other two-wheel carriages have been contrived to suit the taste or convenience of the owners; but none have arrived at sufficient notoriety to require any separate notice. Some have been called buggies, others dennets, others having capacity for carrying dogs have been named Dog Carts. The construction of these carriages is various. The idea of two wheel carriages being unsafe has lately gained much ground in public opinion; but when we consider the extensive use of these carriages, the improper horses so often applied to them, and the unskilful or inexperienced hand which so frequently undertakes to direct them, it is only surprising we do not hear of more accidents. There is a description of horse much used in the west of England, from fourteen and a half to fifteen hands high, and worth about thirty-five pound. Some of these horses, although they look well from good keep and grooming, are heavy in the shoulder, and not calculated for quick travelling. If a horse of this sort be driven in a Tilbury or Stanhope, in event of a stumble (which is very likely to occur) he must fall; and as the front part of the carriage descends with him, the riders are necessarily thrown out. The fault is then attributed to the carriage, when it more justly appertains to the horse; and if such an animal was driven in a four wheel carriage, the riders would have remained steady during a similar fall, and thus escaping injury, the occurrence would not be called an accident. For horses of this description, it is scarcely necessary to observe, a carriage with four wheels is the most suitable. Hence it becomes evident, before we condemn two wheel carriages as unsafe, or reckon upon the advantage of one with four wheels, we should pay some attention to the horses to be used in drawing them. I’ve been researching railroads for my Wicked series. Isn’t my life exciting! I thought I would excerpt some passages from The Railways of Great Britain and Ireland Practically Described and Illustrated published in 1842 that describe the railway carriages that my characters might take around England. The first class carriages have each two whole compartments in the middle, with a coupe at each end. The middle compartments will each hold six persons, and each coupe three; altogether eighteen. These smaller compartments will, no doubt, be generally sought after by invalids, and ladies travelling alone. The length of a first-class carriage is 17 feet 6 inches, and extreme length, including buffers, 21 feet 6 inches; the width of the body is 7 feet, and extreme width, including steps, 8 feet 6 inches. The clear height of the body is 5 feet 1 inch; the height of the body and under-carriage 6 feet; and the extreme height from surface of rails 7 feet 8 inches. Each of the middle compartments is 5 feet long and 6 feet 10 inches wide, both in the clear. The seats are 1 foot 8 inches wide, and 1 foot 6 inches high from floor to top of cushion. The seats are separated by elbows in the ordinary way. Each coupe is 3 feet 4 inches long, and 6 feet 10 inches wide; both in the clear. The carriage-doors are each 1 foot 9 inches wide, and 4 feet 7 inches high. Besides the sash in each door, there are fixed side-lights, corresponding in height with the sash, and 9 inches wide; the lower part being of quadrant form. Some of the first-class carriages are furnished with imperials on their roofs, which are 8 feet 6 inches in length, 5 feet hi width, and 2 feet in height. The carriages are painted a dark buff, picked out with black; and the arms of the Company are emblazoned on the middle doors. The second-class carriages are in three compartments, in the usual way; but have the advantage of being closed at the sides. Each compartment will hold eight persons, or twenty-four in the whole. The compartments are open to each other above the dwarf partitions, the tops of which are 13 inches above the seats; the roof being supported intermediately by iron standards, one of which rests on each partition. The length of a second-class carriage is 15 feet 6 inches; and extreme length, including buffers, 19 feet 6 inches. The width of the body is the same as the first-class carriage, viz. 7 feet; and the extreme width, including steps, 8 feet 6 inches. The clear height is 4 feet 11 inches. Besides the first and second-class, there a few third-class carriages, for the accommodation of the poorest class of travellers; these are without seats. In the centre portion is a closed compartment for luggage, the standing berths being at each end. The carriages consist of first, second, and third class. The first class are of the ordinary form, in three compartments; each compartment will hold six passengers, as usual. The weight of a first class carriage is 3 tons 14 cwt., the cost being 4207. They are furnished with lamps at night. The second-class carriages are each in four compartments, and are calculated to hold altogether forty passengers. These carriages are open at the sides, the roofs being supported by upright iron standards, and the ends closed. The length of a second-class carriage is 16 feet, and the width 7 feet, the weight being 2 tons 19 cwt. The third-class carriages are altogether open, but furnished very properly with seats, which are ranged lengthwise, four to each carriage. Each seat is 14 inches wide, and the space between the seats 18 inches. The whole width of carriage is 8 feet, and the length 12 feet 10 inches. On the 1st January, 1840, the number of first class carriages was 107; of second-class, open, 137; of second-class, closed, 36; of mails, 15; of carriage-trucks, 66; of horse-boxes, 44; of parcelvans, 2; and of post-offices, 3. Third-class carriages have lately been introduced, for the convenience of the poorer class of passengers. The first-class carriages are in three compartments, lined and stuffed within, with elbow-divisions on each seat, and furnished with small lamps by day as well as by night, on account of the numerous tunnels. Each carriage will hold eighteen persons. The total weight of a first-class carriage is 76 cwt. The length of the body is 16 feet, and including buffers, 20 feet; the width of body is 6 feet 6 inches, and including steps, 8 feet 2 inches; the body is 4 feet 11 inches high, and the body and under-frame together 5 feet 10 inches. The second-class carriages in general use are open at the sides and closed at each end, and roofed in. These are also in three compartments, and will hold twenty-four passengers. The weight of a second-class open carriage is 51 cwt. The body is 13 feet 6 inches long, and extreme length, including buffers, 16 feet 4 inches; the width of body is 6 feet 1 inch, and extreme width, including steps, 8 feet; the height of the body is 5 feet 3 inches, and including under-frames, 6 feet 1 inch. 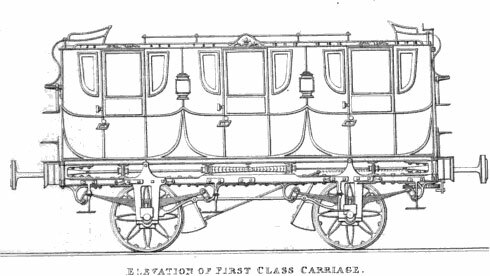 The second-class closed carriages (used with the night-trains) are in three compartments, and will hold the same number of passengers as the last-named; they have glass sashes, and are entirely enclosed, but have no cushions nor linings within.